Alcoholism has been a killer and destroyer of familial peace hiding in plain sight. This is because we chose to ignore it if it does not affect us directly. Many in society still have an attitude of disdain towards persons encumbered by this disease as it is seen as a sign of weakness. The stigma attached to it has led to deaths because alcoholics could not come to terms with their problem and families have been left devastated and in social, emotional and financial turmoil. 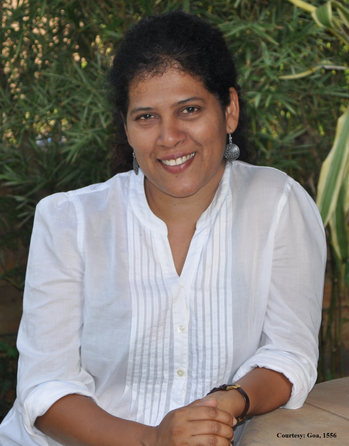 Maria Viency Cardozo’s maiden venture as a writer has resulted in a book Diamonds Under My Feet that offers courage to all those families and individuals afflicted by this insidious malady. She says, ‘The book is all about a message of hope for families suffering because of the problem of alcoholism.’ Even though alcoholism is termed AUD or alcohol use disorder by the DSM-5 (Diagnostic and Statistical Manual of Mental Disorders-5), the awareness of the fact that it is a disease and that sufferers can avail of help to redeem themselves is as yet limited. As she spoke with the wives, widows and children of alcoholics, and in one case with the husband of an alcoholic woman, she did meet with some reluctance to divulge the details of histories. Maria says, ‘Yes, it was difficult. No book would be easy writing. Reluctance from a few because for some it was psychologically disturbing to go back to the past.’ However, many were eager to share their experiences if it could benefit others. Hope for many comes in the form of Alcoholics Anonymous. The Twelve Step programme developed by Bill Wilson and Dr Bob Smith in the USA in 1935 urges alcoholics to introspect, confront their own failings, admit to themselves that the solution is beyond their capacity and acknowledge that in God all things are possible. The group allows recovering alcoholics to mentor others in coping with the addiction and behavioural problems. The book talks about the affiliated groups such as Al Anon and Alateen which are supportive of families of alcoholics and teenagers respectively. Maria derived her title Diamonds Under My Feet from the comment of a member of Al Anon. She says, ‘The title is in connection to the programme Al Anon wherein one interviewee connects all its goodness to diamonds…giving it that much value’. Though other research shows that women alcoholics remain hidden because the burden of shame is greater and reported cases are lower than that of men alcoholics, Maria believes that the onus is on the family to be receptive and compassionate enough to have an intervention. ‘Generally speaking, recovery for all persons would be the same because alcoholism is a disease and needs to be handled in the same way for males or females. If given adequate support from the family even women can come out of it,’ she says. Maria believes that the situation is improving for alcoholics to seek and obtain help easily without the fear of being discriminated. She reasons, ‘Because more families are openly admitting that they have a problem and they need to do something about it. 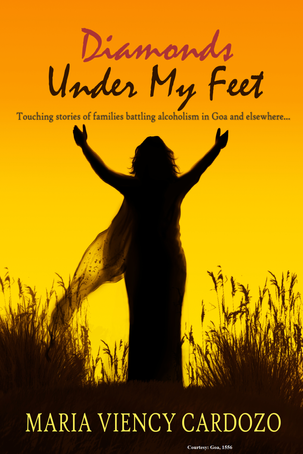 The book Diamonds Under My Feet, which is sure to bring the glimmer of optimism to families wrecked by alcoholism, is published by Goa, 1556 in association with Golden Heart Emporium (Margao) and is available at the rate of Rs 200.